Ectropion and entropion are common maladies of the eyelid margin that can directly affect ocular function and patient comfort; surgical repair is commonly performed. Ectropion (out-turning of the eyelid) can present with keratoconjunctivopathy, infection, and dermatitis, among other signs and symptoms. Tearing is a common presentation, whether the punctum is everted (resulting in a tear outflow problem) or not (as in reflex tearing from irritation and exposure keratoconjunctivopathy). Combined-mechanism tearing is not unusual in these cases. Of these, involutional ectropion (see the images below) is the type most commonly seen in clinical practice. 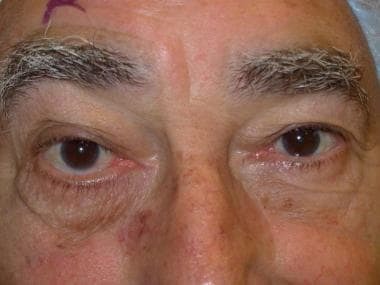 Right lower-eyelid horizontal laxity leading to ectropion, as well as mild lower-eyelid retraction. 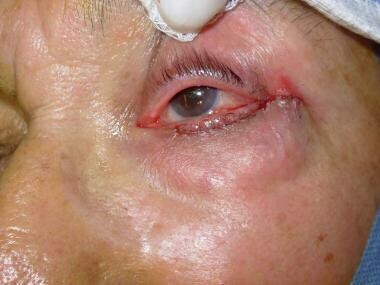 Patient was symptomatic and complained of ocular irritation. Preoperative tape test trial to tighten eyelid horizontally led to relief of patient's symptoms; lateral tarsal strip procedure was planned for treatment. Involutional ectropion of right lower eyelid with pronounced punctal ectropion. Medial spindle procedure to intort punctum, in conjunction with lateral tarsal strip procedure for horizontal tightening, is to be performed. 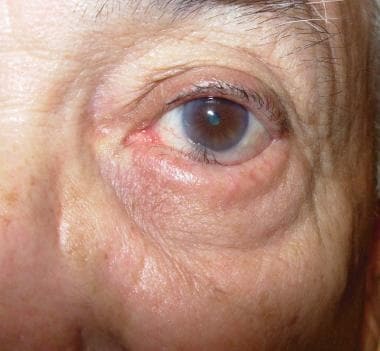 Entropion (in-turning of the eyelid) presents as an irritated eye with foreign-body sensation caused by inwardly rotated eyelashes and eyelid skin. The eye is red from keratoconjunctivopathy. Affected individuals often devise home remedies, such as taping the lid down to the cheek to rotate it away from the globe for comfort. The management of involutional entropion (see the images below) is described in detail in this article. Involutional entropion of left lower eyelid. 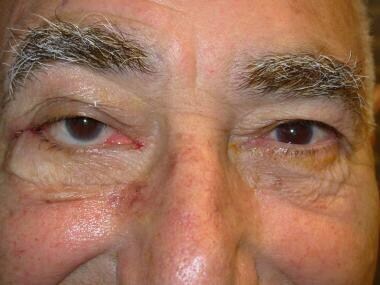 Patient has both horizontal laxity of eyelid and dehiscence of lower-eyelid retractors. 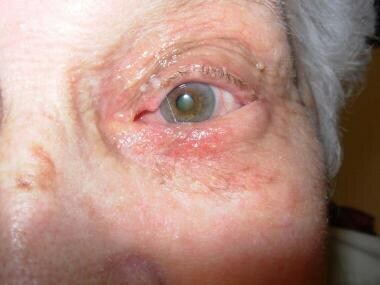 Patient has involutional entropion with dehiscence of lower-eyelid retractors and horizontal eyelid laxity. Finally, some patients develop a forme fruste of involutional entropion that is attributable to early changes from the triad described above. Spastic entropion can result in ocular irritation, which is compounded by an overactive pretarsal orbicularis oculi. The vicious circle of spasms and entropion can often be broken by taping the lid away from the globe, placing bandage contact lenses, or injecting botulinum toxin into the pretarsal orbicularis oculi. Some of these patients eventually need surgical repair of the involutional entropion. Contraindications to surgical repair of either entropion or ectropion are usually based on the medical condition of the affected patient. Uncontrolled systemic hypertension, diabetes, vascular disease, or cardiac disease, as well as systemic anticoagulation (eg, with aspirin, clopidogrel, or warfarin), may be contraindications. These issues should be discussed with the primary physician before surgery so that the risk-benefit profile for intervention can be weighed against that for observation. In patients with cicatrizing conjunctival diseases, surgical intervention should be approached cautiously. An autoimmune or inflammatory component should prompt consultation with the patient's rheumatologist or primary physician so that immunosuppressant medications can be managed and optimized before the surgical repair, which may exacerbate the underlying condition. The success of entropion or ectropion repair depends on good surgical technique. The equipment necessary for entropion and ectropion repair includes an operating table with head extension. Overhead or headlight illumination is required. No magnification is generally required, although some surgeons prefer loupe magnification. Stainless steel instruments and a bipolar cautery are sufficient. Appropriate anesthesia and proper positioning are important for surgical repair of ectropion and entropion. Surgical repair of entropion and ectropion can generally be performed with local anesthesia, with or without intravenous (IV) sedation. A topical anesthetic (eg, proparacaine eye drops) applied to the affected eye(s) is used during repair of involutional ectropion or ectropion. Infiltrative anesthesia (1-2% lidocaine with 1:100,000 epinephrine) is administered subconjunctivally, with the needle directed away from the eye and entering just below the inferior tarsal border of the lower lid laterally. 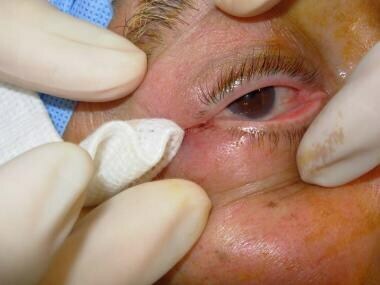 The injected anesthetic spreads in a subconjunctival plane across the lower lid. 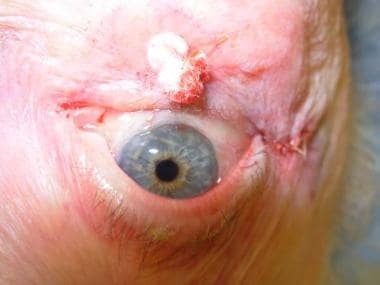 A second injection is placed in the subcutaneous tissues of the lateral canthus and lower eyelid, with additional anesthetic infiltrated down to the lateral canthal rim in the vicinity of the lateral orbital tubercle. Nerve blocks are generally unnecessary, although an infraorbital block can be achieved by directing the needle in the subconjunctival space toward the face of the maxilla in the same vertical plane as the pupil in primary gaze. Zygomaticofacial blocks may be employed as needed. These 2 nerve blocks may be helpful when broad undermining for scar release and skin graft placement is considered. The authors' preference is to place the patient in the supine position on an operating table with a head extension. A pillow or some other support is always placed under the patient's knees to remove tension from the patient’s lower back. The entire body and head should be level and parallel to the floor. Because the operating time for these procedures is short, compression devices for deep venous thrombosis (DVT) prophylaxis generally are not needed. The surgical techniques employed to treat ectropion and entropion generally have a number of steps in common. Because both procedures have a step in which the component of horizontal laxity is addressed, this step will be described first. For a large percentage of ectropion cases, the initially described step of horizontal tightening is all that is required to accomplish repair. Right lateral canthotomy has been performed. Inferior cantholysis is performed with a scissors (see the image below). It is not necessary to lyse every fiber of the inferior canthal tendon crus; cantholysis should be just sufficient to permit adequate lateral pulling of the lid for the purposes of tightening. Overly zealous dissection will cause more bleeding from an already tight operative space without adding much to the procedure's efficacy. Hemostasis should be obtained with a monopolar or bipolar cautery. Right inferior cantholysis has been performed to allow mobilization of right lower eyelid. 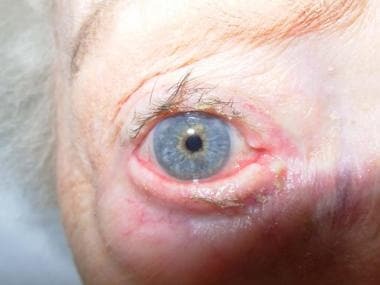 The now-disinserted lower lid is split into anterior and posterior lamellae along the grey line of the eyelid, yielding a skin muscle flap anteriorly and a flap comprising the tarsoconjunctival and postseptal tissues posteriorly. How far the lid is split laterally depends on the degree of horizontal laxity. This step should be performed in cautious advancing increments in a lateral-to-medial direction to avoid overtightening of the lid. The palpebral conjunctiva and the lower-lid retractors are then cut and disinserted from the inferior border of the tarsus from lateral to medial for the appropriate distance (see the image below). This disinsertion is required in most instances of horizontal tightening. If only a small tuck of the lateral canthal tendon is required, medial dissection is minimal. 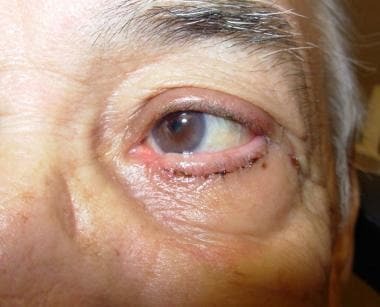 Lower-eyelid retractors and palpebral conjunctiva have been cut from inferior border of tarsus laterally, and lid margin epithelium has been excised with electrocautery. Horizontal redundancy has been marked for subsequent excision to achieve horizontal shortening. A prepared strip of tarsus is visualized, then rotated laterally to allow the surgeon to judge the amount of redundant tissue to excise. The area to be excised is marked or scored to prevent overresection or underresection. The part of the strip to be attached at the lateral orbital tubercle is then debrided of conjunctival epithelium by shaving with a No. 15 Bard-Parker blade. The lid margin epithelium is similarly removed with either sharp scissors or a monopolar cautery. These 2 maneuvers avoid burying epithelial tissues. The excess horizontal tendinous and tarsal tissue is then cut along the marked borders. A 4-0 polyglactin suture is passed though the prepared strip of tarsus (see the image below); a single pass from anterior to posterior is usually sufficient. The needle is then repositioned on the needle driver and passed through the periosteum at the level of the lateral orbital tubercle. This is a somewhat deep suture pass, and visualization of the needle is difficult. Passage is aided be the use of the semicircular P-2 needle, which requires minimal rotation of the needle tip and hub and reduces the risk of inadvertent soft tissue (and globe) injury. Redundant lateral canthal tendon and tarsus have been excised, and 4-0 polyglactin suture has been passed through prepared tarsal strip. Needle can be seen passing through periosteum at orbital rim in region of lateral orbital tubercle. Passage is greatly facilitated by stout, semicircular P-2 needle. After a solid purchase of periosteum is obtained, the sutures ends are overlapped so that the effect of tightening can be observed. If the newly created lateral insertion is too high or too low, the suture should be removed and replaced. The same is true if the insertion is too deep in the orbit or too superficial. Once a satisfactory insertion is achieved, the suture is tied down with multiple square knots (see the image below). 4-0 polyglactin suture has been secured with multiple square knots to complete lateral tarsal strip fixation. Lateral canthal angle is shown being reformed with 6-0 fast-absorbing gut suture. If anterior lamellar tissue excess is evident at this juncture, conservative marking and construction of a dog-ear excision can be performed. The lateral canthal angle is then repaired with either a 6-0 polypropylene suture or a dissolvable suture of 6-0 fast-absorbing gut. 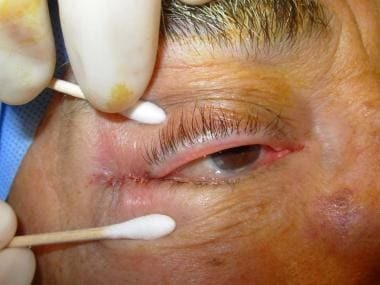 The suture should pass just inferior to the lower-lid lash line of the new canthal angle and should exit at the eyelid margin. 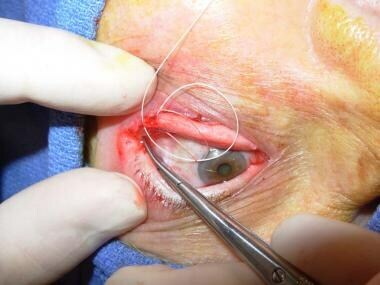 The suture is then directed through the lid margin of the upper lid, exiting just superior to the lash line. Multiple square knots are used for fixation. The canthotomy and the area of dog-ear excision are closed with the same suture material (see the images below). Canthotomy incision has been closed with multiple interrupted 6-0 fast-absorbing gut sutures. Immediate postoperative view after lateral tarsal strip procedure for right lower-eyelid ectropion. A medial spindle procedure may be considered for residual punctal ectropion in tearing patients (see the images below). 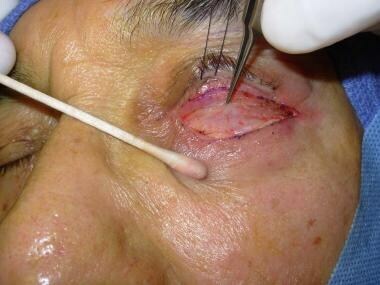 Surgical marker outlines medial spindle of tissue to be removed from posterior lamellar surface of eyelid. Approximately one third of ellipse is situated medial to punctum and two thirds lateral to punctum. Ellipse is 5-6 mm wide, depending on extent of ectropion, and is marked approximately 3-4 mm from eyelid margin. Prepared tarsal strip is visible in image. Ellipse of tarsoconjunctival tissue has been removed, and overlying orbicularis oculi is seen. Double-armed 5-0 plain gut suture has been passed through ellipse medially and laterally in buried fashion to close created defect. Needles will then be directed full-thickness toward skin surface in anteroinferior vector. 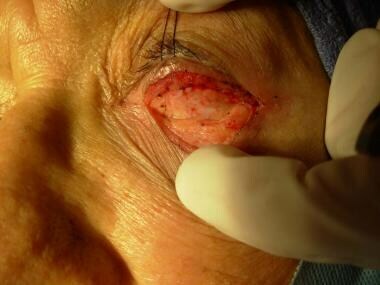 When sutures are tied down over skin, they will help further intort lid margin and punctum. Lateral tarsal strip has been completed for horizontal tightening. Double-armed 5-0 plain gut suture has been tied down over cotton bolster under moderate tension. Bolster is helpful in preventing "cheese-wiring" of sutures through thin skin. Note well-positioned punctum relative to globe. In the authors’ experience, repair of involutional entropion usually proceeds similarly to repair of involutional ectropion with respect to the horizontal laxity component of the disorder. Many options are available for repair of the vertical component (dehiscence of lower-lid retractors); the authors have found that both lower-lid retractor reinsertion and full-thickness sutures work well. Before the horizontal procedure described above, a marking pen is used to outline an infraciliary incision extending from the punctum laterally into a lateral canthal skin fold. A full-thickness skin incision is then made with a No. 15 Bard-Parker blade along the marking (see the image below). 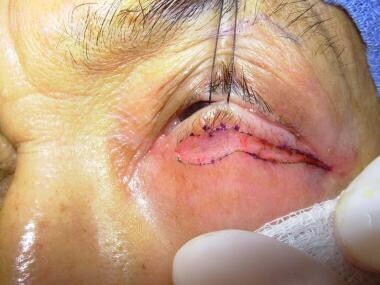 Silk traction suture has been placed through lower lid margin to place lower lid under vertical tension, and infraciliary incision has been made through skin and orbicularis oculi to directly access lower-eyelid retractors for reattachment to tarsus. A skin muscle flap is then elevated across the horizontal width of the incision in the sub–orbicularis oculi fascial plane. The flap is elevated inferiorly until the underlying orbital septum is visualized, along with the whitish postseptal lower-lid retractor aponeurosis. The orbital septum is then opened across the width of the eyelid (see the image below), and the edges of the lower-lid retractors are grasped with a toothed forceps and rotated superiorly to the inferior edge of the tarsus. Orbital septum has been opened (note preaponeurotic fat pad near inferior skin edge), and toothed forceps is used to grasp edge of dehisced lower-lid retractors. Sutures of 6-0 polypropylene are used to secure the superior edge of the retractors to the inferior border of the tarsus (see the images below). The lid may be slightly ectropic at this juncture; this state will be addressed subsequently by means of horizontal tightening. 6-0 polypropylene suture has been passed through superior edge of dehisced lower-eyelid retractors and attached to inferior border of tarsus. Multiple 6-0 polypropylene sutures have been used to reattach lower-eyelid retractors to inferior border of tarsus. From this point, the repair proceeds as for the horizontal tightening operation described above (see the images below). The lower-lid infraciliary incision is closed with a continuous suture of 6-0 polypropylene or 6-0 fast-absorbing gut. Canthotomy and inferior cantholysis have been performed to prepare for horizontal shortening of eyelid via lateral tarsal strip procedure. Redundant lateral canthal tendon and tarsus have been excised to effectively shorten eyelid horizontally. 4-0 polyglactin suture has been passed through prepared tarsal strip, and suture is seen engaging periosteum in region of lateral orbital tubercle. Suture passage is facilitated by use of semicircular P-2 needle. Lateral canthal angle has been reformed with 6-0 fast-absorbing gut suture. Infraciliary incision and canthotomy incisions have been closed with same suture material. Postoperative view 1 week after entropion repair via lower-eyelid retractor reinsertion and lateral tarsal strip procedure. Procedure has accomplished dual purpose of repairing both vertical and horizontal components of entropion. The operation proceeds as for the horizontal laxity repair described above (see the images below). Before the 4-0 polyglactin suture is tied down at the lateral rim, full-thickness sutures are passed. Eyelid has been anesthetized. 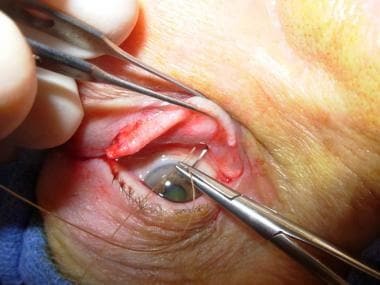 Lateral canthotomy is performed to begin creation of tarsal strip for horizontal tightening of eyelid. Tarsal strip has been created. 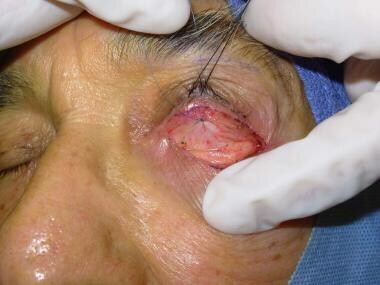 Full-thickness eyelid sutures are passed from conjunctival fornix to skin surface. These sutures should engage dehisced lower-lid retractors during their passage and draw retractors superiorly to region of inferior tarsal border at their exit site. Suture passage is facilitated by using double-armed suture to allow all needles to be directed away from globe. Three sets of double-armed 4-0 chromic suture are passed: 1 in the nasal third of the lower lid, 1 in the central lower lid, and 1 in the lateral lower third. The first suture enters from the palpebral conjunctival surface deep in the lower fornix (and through the visible edge of the whitish retractor aponeurosis, if this is visualized). 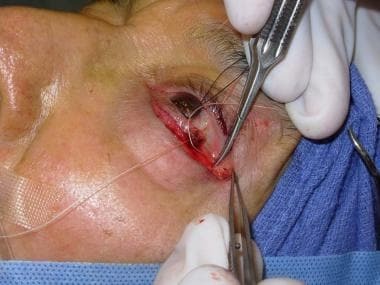 The suture is then directed anteriorly and superiorly, exiting a few millimeters below the lash line. The second arm is directed adjacent to and approximately 3-5 mm from the first pass. All 3 sets of sutures are passed in this manner. The double-armed sutures are then tied over the skin under moderate tension (slight ectropion may be seen) or over cotton bolsters. The authors prefer the latter to prevent "cheese-wiring" and the occasional formation of suture abscesses. The operation then continues with the horizontal tightening procedure, as described above (see the images below). 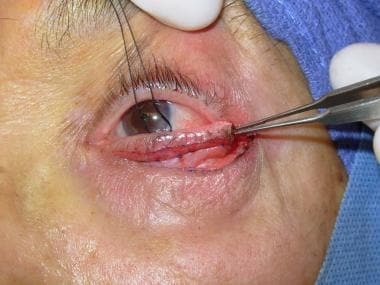 One set of double-armed sutures has been passed through full thickness of eyelid and is now tied over skin surface. 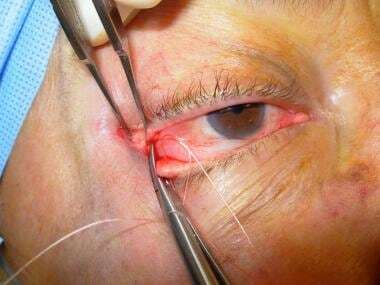 Note slight eversion of lid margin as sutures are tied under variable tension. 4-0 polyglactin suture is passed through prepared tarsal strip to enable horizontal eyelid tightening. 4-0 polyglactin suture is then passed through periosteum in region of lateral orbital tubercle, in slightly more superior position than medial canthal angle. Suture passage is facilitated by use of semicircular P-2 needle. Tarsal strip has been attached laterally, and canthotomy incision has been closed to reform lateral canthal angle. 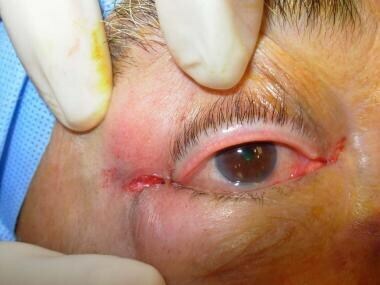 Eyelid has been tightened horizontally and vertically (note slight lid margin eversion). Burroughs JR, Soparkar CN, Patrinely JR. Rotation mattress suture: a powerful adjunct for ectropion correction. Ophthal Plast Reconstr Surg. 2003 Sep. 19(5):404-6. [Medline]. Nowinski TS, Anderson RL. The medial spindle procedure for involutional medial ectropion. Arch Ophthalmol. 1985 Nov. 103(11):1750-3. [Medline]. Cannon PS, Sadiq SA. Can eyelid taping predict the benefit of a lateral tarsal strip procedure in patients with eyelid laxity and functional epiphora?. Ophthal Plast Reconstr Surg. 2009 May-Jun. 25(3):194-6. [Medline]. Jyothi SB, Seddon J, Vize CJ. Entropion-ectropion: the influence of axial globe length on lower eyelid malposition. Ophthal Plast Reconstr Surg. May-June 2012. 28 (3):199-203. [Medline]. [Guideline] Roberts MA, Baddeley P, Sinclair N, Lane CM. The lower lid diamond: a simple entropion repair to correct both horizontal and lower-lid retractor laxity. Ophthal Plast Reconstr Surg. Jan-Feb 2012. 28 (1):44-46. [Medline].